Although a flat tire can be an annoying experience, there is help for you when you need it the most. 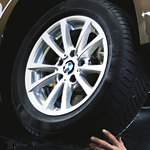 With your BMW tire purchase, there is a complimentary benefit - the BMW Road Hazard Tire Coverage! If your tire is punctured due to a nail, glass, or any type of foreign object, you're covered for a tire replacement, if needed! Each eligible tire replacement is covered for up to $600 and there's no cost to you whatsoever for processing a claim. Once you sign the tire replacement invoice, you just drive away! It's that simple and that easy! While it's better if you return to the original dealership, you also have a choice of BMW Tire Centers nationwide to handle your claim. Grand Blanc Motorcars wants you to stay safe while on the road; therefore, let us how we can help with your next purchase of BMW approved tires. Call us or stop by today.